Two books from Ancient Faith Publishing by Archimandrite Vassilios Papavassiliou provide food for thought during the Lenten season. 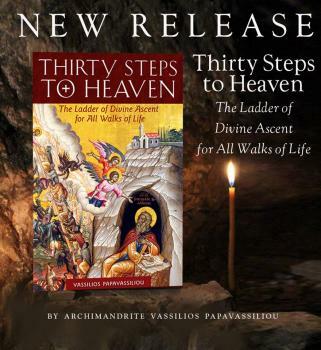 In the new release Thirty Steps to Heaven: The Ladder of Divine Ascent for All Walks of Life, Archimandrite Vassilios interprets the weighty classic, The Ladder of Divine Ascent, for the ordinary Christian, helping non-monastics to see how to apply the principles of The Ladder in everyday life. In Meditations for Great Lent, he uses hymns from the Lenten Triodion and the Scripture readings appointed for the season, to reveal how our fast can be made acceptable: to fast not only from food but from sin; to fast with love and humility, as a means to an end and not an end in itself. Archimandrite Vassilios Papavassiliou is a priest of the Greek Orthodox Archdiocese of Thyateira and Great Britain. He was born in London in 1977 and holds degrees in Pastoral and Social Theology, Classics, and Byzantine Music. He is also the author of Meditations for Advent (Ancient Faith Publishing), Journey to the Kingdom: An Insider’s Look at the Liturgy and Beliefs of the Eastern Orthodox Church (Paraclete Press), and numerous articles on Christian Orthodox faith and theology.